Youth will feel better about themselves and help their communities by giving service that will brighten someone’s day or strengthen their community. When my husband was in medical school he was assigned to do an obstetrical rotation in Wichita, Kansas. We stayed at a hotel next to the hospital for 2 months with our 2 and 3-year-old sons. Each day the boys and I walked next-door to have lunch with Daddy at the hospital. We entered the building through the cancer center because it was the door closest to the hotel. I’m not sure who was watching from the windows, perhaps an employee or cancer patient. And I’m not sure what they thought we were doing there – perhaps they thought that I was bringing one of our boys for cancer treatments. After a few days, we discovered that someone had hidden 10 pennies in the courtyard outside the cancer unit. Our boys raced around to find them under a bush or behind a flower and cheered when they found each hidden treasure. This was repeated every day for 2 months. Have you ever felt the excitement of waiting for someone to discover a secret gift you left them? Or of watching someone’s face light up when they realize you have done something kind for them? Have the youth in your life felt the joy that comes from giving time and service? 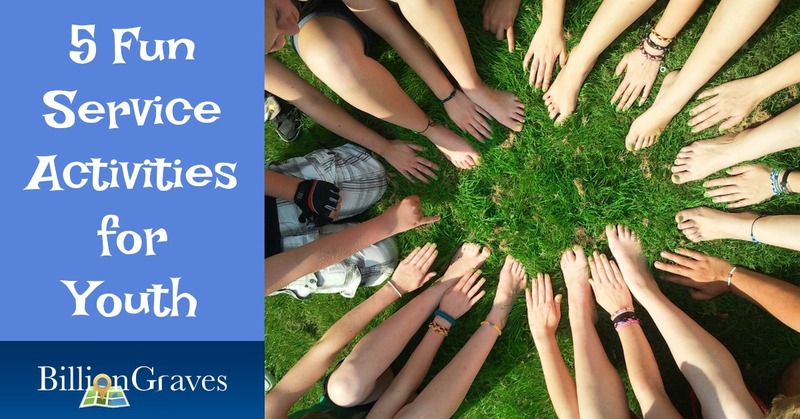 Check out these 5 fun ways youth can spread some kindness and make an impact in their community. Grab your smartphone, download the free BillionGraves app and head out to your nearest cemetery. It’s as easy as taking pictures of each grave as you walk along. The app will capture the GPS location automatically and in just a short visit hundreds of records can be preserved. When you are finished the photos are uploaded with one click of a button, so everyone can use them for family history and to keep the memories alive of those you honor and love. At the cemetery, divide your youth group into pairs. As one person takes photos in a row their partner takes photos in the next row. They leap-frog over their partner’s row when their row is done. Race to take the most photos in a certain amount of time. Emphasize that the photos should be good quality with names and dates visible. Winners get a candy bar. Here is a free printable candy bar wrapper. I’ll never forget the day a youth group showed up at our door with a service scavenger hunt checklist and offered to serve our family. I had recently broken my right arm which made doing dishes, vacuuming and folding laundry really tricky. A group of 8 youth served us for about 30 minutes and what an impact it made! One vacuumed the stairs, a couple scrubbed the bathroom, and another washed windows. Others swept the kitchen floor and wiped down countertops and cupboards. By the time they left, our home was shiny and our hearts were happy! 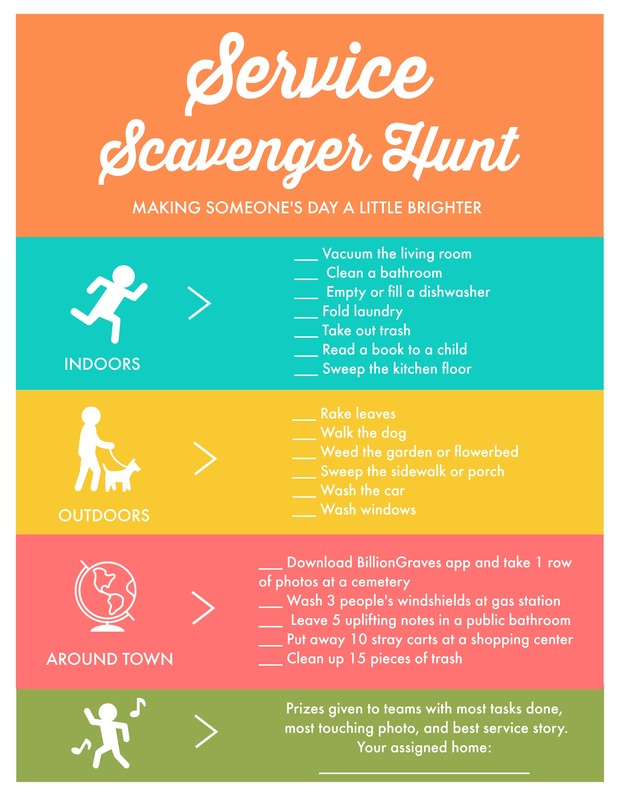 Here is a free printable service scavenger hunt checklist. Arrange with a few families in advance to have teams of youth stop in to provide service. Write the addresses of the assigned homes at the bottom of the checklists. As youth complete each service activity they should ask the family to initial their checklist. They can also take photos of their service in action. There are ideas on the checklist for serving in the community too, such as taking cemetery photos, washing people’s windshields at a gas station, and putting away stray shopping carts. Instruct youth to stay together as a team for safety. After the activity, gather to share stories about their experiences and show the photos they took. The homeless are often a forgotten class of people. Others see them and then look away. 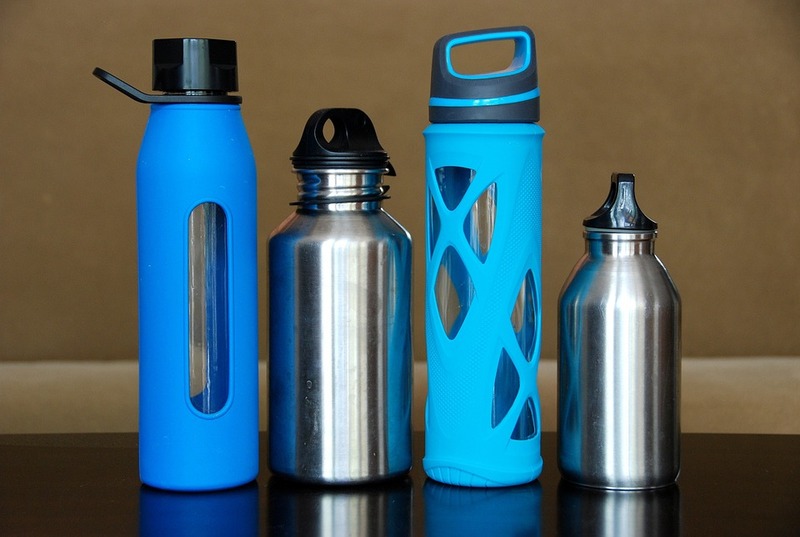 Your youth group can put some blessings in a bottle to be given to people without a home. When you are done, drop them off at a homeless shelter to be distributed to those in need. Ring the doorbell and run! 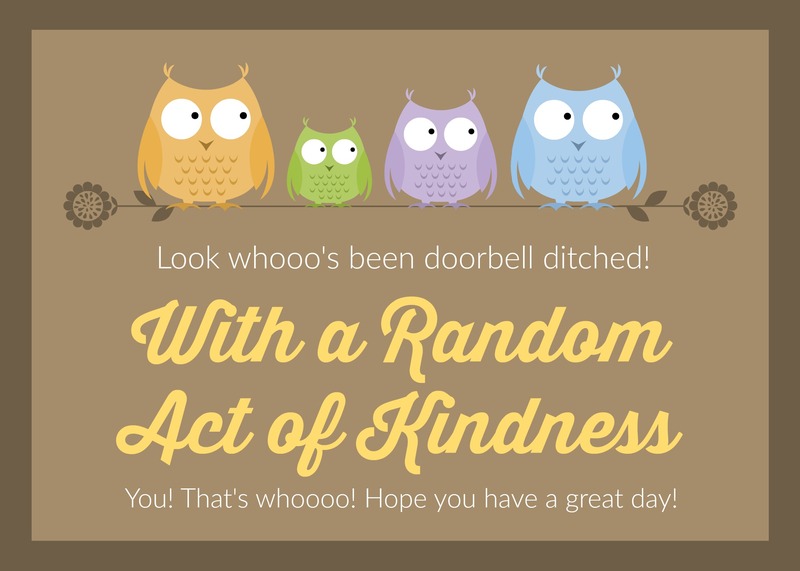 This service activity holds all the fun and excitement of sneaking up to a door and then getting away quickly but also leaves behind a random act of kindness to make someone smile. Attach this cute free owl printable with tape or a ribbon to a plate of cookies, package of diapers, loaf of bread, candy bar, or gift card. Youth sneak up to the front door while an adult waits just up the street with the “get-away car”. Quietly prop the item against the front door, ring the doorbell, and then run like mad! As the car pulls away, imagine the smiles on the faces of those you have served. Youth love to use laptops and tablets and they love competition. This fun service activity combines both. Transcribing cemetery records helps people who are looking for their ancestors for family memories or genealogy. Ask the youth to bring their laptops or tablets to the activity. Provide extras for those who don’t have any. Divide into two teams with each group sitting at a table. Put two jars on each table, one filled with marbles and the other one empty. Instruct the youth to set up a free account on BillionGraves.com. Select the “volunteer” tab and then choose “transcribe” from the drop-down menu. Fill in the names and dates as seen on the gravestone photographs. Each time a name is completed, move a marble from the full jar to the empty jar. At the end of the activity, the team with the most marbles in their jar wins a prize. Service helps us generate love and appreciation. We come to love that which we serve. If you would have more love for your parents – serve them. If you would have more love for your siblings – serve them. If you would have more love for your ancestors – serve them. If you would have more love for your fellowmen – serve them. If you would have more love for even your enemies – serve them.